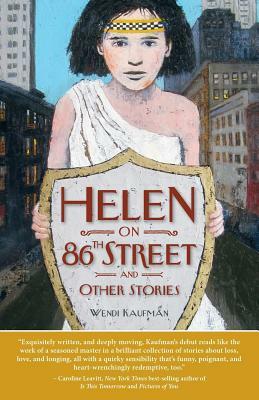 Helen on 86th Street and Other Stories by the late Wendi Kaufman is smart, hilarious, heartbreaking, and beautiful. With clean and precise prose, Kaufman has assembled a brilliant collection of short stories about women. The 14 pieces within the book are constructed in layers—story, metaphor, myth, and reflection—built to be both accessible and yet complicated. Her pieces may be read once for meaning and then again for nuance and insight, each ending with a thrilling flourish, tempting a reader to rush ahead into the next piece. But Kaufman's stories deserve to be concluded with a pause, a sigh of release, and a reflection. Though each piece has enough substance to stand on its own, as a collection, Kaufman's stories have a satisfying synergy. When Kaufman passed away from cancer in August of 2014, this debut collection turned out to be the culmination of her life's work. But Helen on 86th Street and Other Stories does not read as a first book. Rather, it is a triumph from a skilled and intelligent writer. "Helen, again with Helen. Always Helen," my mother said. "You want to know about Helen?" "Well, her father was a swan and her mother was too young to have children. You don't want to be Helen. Be lucky you're a warrior. You're too smart to be ruled by your heart." A few years earlier, Vita's father had left both of them, and ever since, she has been writing letters to her dad—letters she keeps in old shoeboxes. One night, Vita makes a burnt offering of this precious collection of letters to the goddess Athena, asking her to intervene and give her the role of Helen. "Troy, I have come to ask you to forgive me." I'm supposed to hit my fist against my chest, draw a hand across my forehead, and cry loudly. (My teacher) has shown me this gesture, practiced it with me in rehearsal a dozen times—the last line, my big finish. The audience is very quiet. In the stillness there is a hole, an empty pocket, an absence. Instead of kneeling, I stand up, straighten my tunic, look toward the audience, and speak the line softly: "And to say goodbye." There is a prickly feeling up the back of my neck. And then applause. The noise surrounds me, filling me. I look into the darkened house and, for a second, I can hear the beating of a swan's wings, and, then, nothing at all. It's just this sort of personal victory—a victory of self-knowledge, of coming-of-age—juxtaposed against a complex mix of guilt, desire, doubt, and tragedy that haunts many of the mostly female characters that Kaufman writes about. Like Vita, many of Kaufman's female characters are too smart to be ruled solely by their hearts, but they follow them anyway. Many of them are lonely and helpless and desperate for forgiveness, but they are able to flee their own burning cities, achieving small victories and modest bits of wisdom. Kaufman's women make bad choices, they falter, and Kaufman nudges the reader to sympathize with them and even cheer them on. Although alike in many ways—female, middle class, and American, with ties to New York City and the surrounding areas—Kaufman's characters remain distinct and singular. One is a teenager who lives with her boyfriend and her elderly father. One is a woman working to rekindle a stale relationship. Another, an author of an advice book for women, struggles through the media training required by her publisher. And still another is a college student from a family of psychics who believes she lacks "the gift" of her mother and grandmother. I must admit that each of these women reminds me of someone I already know—women who keep making the wrong decisions, who still have a lot to learn, and yet from whom I find that I can still learn about passion and empathy. In another of Kaufman's stories, "Still Life," a high school girl named Lucinda witnesses her mother slipping into a bout of paralyzing mental illness. Her mother sits in the same spot on the sofa for almost a week. When Lucinda tells her father, living in a different part of the city, about her mother's mental state, he comes to the apartment to take her mother to get treatment. But Lucinda resists, trying to protect her mom, and her dad accuses her of "acting as crazy as she is." Then, as her father tries to comfort her, Lucinda says, "I wasn't really listening. I was holding my breath as if underwater, watching how the moonlight through our window burned away the shadows." Lucinda knows her mother would have seen this same vision, too, sitting in the same place "night after night, submerged as the growing light rippled across the floor." Though they are mother and daughter, members of the same family, Lucinda wants her father to know that this inheritance does not condemn her to her mother's fate; "there are bulbs that look similar before they're planted, I wanted to tell him, but are nothing alike after they've bloomed." Two years ago, when I became a new mother, I found myself feeling a bit like Lucinda sitting in her mother's spot on the sofa, understanding her yet also not wanting to be her. I had a brand new understanding of my own mother, seeing her in myself. And yet I also hoped (and still hope), desperately at times, that I will bloom differently. Mothers, daughters, and sisters often appear in Kaufman's stories, and all of these characters are learning about themselves in unexpected ways. Even as they make mistakes or experience heartbreak and tragedy, they grow. One has just had a miscarriage and has been told that she can try again: "Try again?" she thinks. "You don't know how you could ever try again and yet you know somehow that you will. And this feels like hope." Another realizes she needs to move on after her current boyfriend—who doesn't call when he travels for work and rarely texts—has canceled on her again. For the first time she understands that there is a difference "between falling out of love and falling apart." Talking to herself in a new, soothing way, she knows that, one day, this gentle voice will be the only one she hears. Still another of Kaufman's women walks away from a rebound lover when her old lover leaves his wife and returns to her. Familiar with loss, rediscovery is new to her: "the other half of the picture," as she calls it. "Love and loss entwined, a knotted tangle of grief and desire. She walked toward him then, knowing that if she didn't she would never move; she would still be there in the middle of the street, hugging her sides tightly, lost in a middle space, never finding what was within her reach." Again and again in Kaufman's stories, growth comes with pain, love comes with loss, and wisdom comes after a good bit of foolishness and embarrassment. Through her honest and well-crafted stories of women struggling with others and with themselves, Kaufman has composed a stunning chorus of female voices, both compelling and complex. Helen on 86th Street and Other Stories belongs on every woman's bookshelf within close reach—a volume to accompany her as she herself struggles to find meaning, connection, and identification within her own life.